Mal'ganis is a sustain "tank" that is designed to not only keep himself alive, but also have the tools to peel for allies and sponge any damage they might receive. He has a fair amount of crowd control, healing, and sustained damage, but struggles against Heroes that can kite as he has little mobility, and Fel Claws offers a staggered means of engaging. In terms of playstyle, it's hard to place Mal'ganis because he has the solo clear and lane sustain of someone like Blaze, but the AOE/disruption of Yrel. Unlike both however, he can't immediately dive into combat (certainly not like Diablo can) and this limits his ability to pick out a target. The fact his stun is also staggered on Fel Claws sees him having to rapidly deliver attacks to lock someone down, means that there's plenty of opportune moments to prevent his actions. Despite this, Mal'ganis can trade well versus most Heroes, hold a lane easily, and with the right talents, have high sustain. A better off-Tank than solo, he's a good fit when all else fails. Vampiric Touch (Trait) - Allowing Mal'ganis to gain a significant amount of healing based on attacking Heroes or minions, the sustain Vampiric Touch offers is considerable. If you also factor in that the majority of his abilities are AOE - which triggers his Trait - his sustain can be incredibly high if he's in amongst multiple opponents. With basics also providing healing, when in lane Vampiric Touch offers excellent healing without having to reach for abilities. Fel Claws (Q) - A three-stage staggered attack, Fel Claws is a short-ranged lunge that ends with Mal'ganis stunning his target. Each slash pushes Mal'ganis forwards that little bit more, ensuring he can close a small distance. Fel Claws sweeps through multiple targets, clears waves easily, and keeps his health topped up. Just be conscious of the fact you can be interrupted at any time during your swings. Necrotic Embrace (W) - Providing Mal'ganis with an instant +25 armor, Necrotic Embrace also provides a short-duration AOE pulse that deals damage to all those around him. Used in amongst a crowd, the healing is significant and ensures Mal'ganis can withstand a great deal more punishment while still dealing damage. Just be conscious of the fact you can still be hit with CC during Necrotic Embrace, and it's best to use it only when multiple enemies will take damage. Used against a single target isn't ideal: you'd be best off using Fel Claws or basics, unless the armor mitigation will save your life. Night Rush (E) - Providing his second form of mobility and crowd control, Night Rush is as much an offensive tool as it is defensive. Granting movement speed and sleep when he comes into contact with an enemy Hero, it's great for locking down enemies trying to escape, or just for retreating. Try not to use Night Rush unless you can be sure it'll gaurentee your engage, or escape. The cooldown is simply too long to waste. Dark Conversion (R) - I've found this Heroic limited, and despite its potential potency (not too disimilar to Alextrasza's Life-Binder), it's eclipsed by the accessibility and instant value of Carrion Swarm. That said, if you are in a solo Tank position, it's worth a punt simply because it does provide some much needed sustain. Carrion Swarm (R) - A fire and forget ability, Carrion Swarm offers Invulnerability and 100% healing from your Trait for its duration. For massive healing if in amongst the enemy team, it's a no-brainer. Just be aware that it has a 1 second cast time, meaning you can be interrupted before you even cast. Vampiric Aura increases Mal'ganis' healing - and that of his team-mates - by an additional 10% based on the damage he deals. Effectively, as long as he's dealing damage this bumps his Trait up from 45% against Heroes, to 55% against Heroes. A significant amount for sustaining himself. 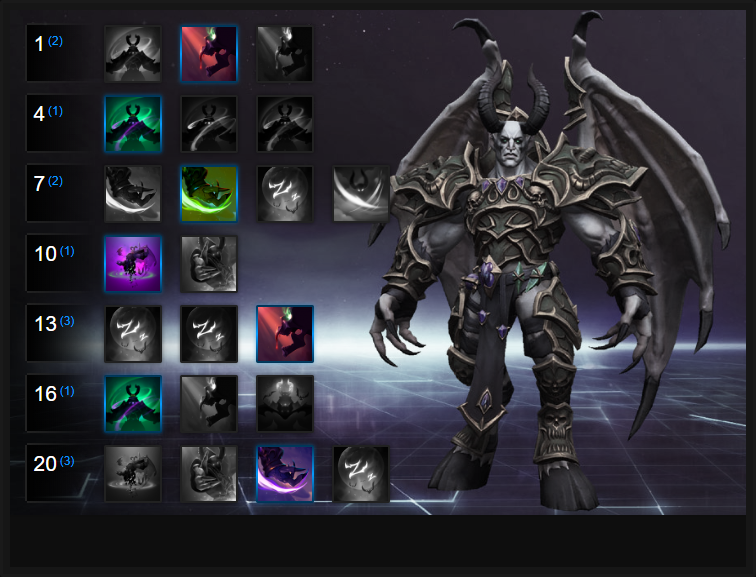 Improving his sustain event further, Fueled By Torment grants Mal'ganis an additional 15% increase on his Trait when he has Necrotic Embrace active. Combined with Vampiric Aura, he can jump to 70% healing when dealing damage against Heroes, just by having his Necrotic Embrace active. Considering the ability also provides AOE damage and armor, it's little wonder he's hard to bring down. It's a mouth full, but Will of Tichondrius increases Mal'ganis' healing even more, allowing his Fel Claws - and the third slash - to heal him for 4% of his maximum health. Considering this can trigger against multiple Heroes, and combined with his other abilities and Traits, it offers ridiculous sustain. Providing some much needed mobility, Blood Rush allows Mal'ganis to increase his movement speed by 1% (up to 15) when he's healed by a Hero. Its duration is 8 seconds long, and plays into his other Traits, ensuring that he maintains his movement speed the moment his team being to deal damage. A simple Talent that simply allows Mal'ganis to fire off additional damage when he winds up Plague Bats, it's a welcome addition to his DPS that ensures he gains more AOE healing from those he hits. As his last Talent, Vaniquish the Weak boosts his Trait healing even further (I know, it's ridiculous) to provide 10% extra healing against slowed targets. With Vanquish the Weak allowing your Fel Claws and Basic attacks to slow, it's a free dose of sustain. This list of tips and tricks are just a handful of things we think will help your Mal'ganis play. We'll continue to add to the list as required and if you have any tips you'd like to share, let us know in the comments below and we'll place them here. 1. Your trait provides health back to you, based on the damage you deal. 45% of the damage converted against Heroes, and only 10% versus minions. It provides some lane sustain, but heavy pressure early game will still kill you. 2. Try to make use of your AOE potency to trigger your healing. Hitting multiple targets with Fel Claws and Necrotic Embrace can keep you topped up. 3. Fel Claws requires you to activate it three times in order to have Mal'ganis charge forwards. Use it quickly to zip towards the enemy, resulting in a stun. Be aware that you can hang off the final attack, to time it perfectly. 4. Necrotic Embrace deals AOE damage, but also provides 25 armor for 3 seconds. While you can use it for damage, and some health return, its primary value is the mitigation. Use it when under heavy fire, especially when needing to escape. 5. Night Rush can be interrupted, take this into account when casting it. 6. Use Night Rush to escape when under pressure, and due to the sleep duration, don't be afraid to zip into enemies, and then back out. 7. Try to always land your stun from Fel Claws on a high value target. Once stunned, body block them to limit their escape. 8. When you boot up Carrion Swarm, dive into any back-line and harrass the Support. When it ends, use Fel Claws for a double-punch of damage/disruption. In this Mephisto Build Guide, we provide an overview of his strengths, abilities, talents and matchups.